So, I'm in a trough. Not really sure why. I'd like to say it's the renewed mixed signals from Tilly (she wanted to do something special for Valentine's, was unable due to illness and tiredness. I raised it yesterday and was met with "Ugh, no, why even bring it up?") or the numbing realisation that I am slowly becoming That Guy when it comes to our sexual relations (in that I am pushing every now and again but with continual rebuffs). It probably isn't. Watching Cold Feet doesn't help. They're all shits to one another, of course, but there's a playfulness and affection there that, despite the fact I know Tilly loves me, is missing at home. Pik and Sierra were up on the weekend. It was a nice time. Pik and I sampled beers. I shall devote this post to that. First beer was mine. My brew. It smelled sweet, fruity and light but lacked the citrus-y tang one associates with hops. None of the spiciness of yeast or the mustiness of malt, more mulled than sharp. It poured ginger and auburn with a depth to that colour suggestive of wood but without a head, some froth, with a light and eminently acceptable carbonation by dint of being bottle conditioned rather than added under pressure. In tasting there was a subtle hint of limited yeast that was instantly replaced by a summery light malt, filling the space in the taste, before fading to the bittering hops to finish it off. After-taste was agreed to be acceptable, mainly hops. Overall, this was a surprisingly standard, uncomplicated ale that worked well to explain the rudiments of beer tasting to Pik. 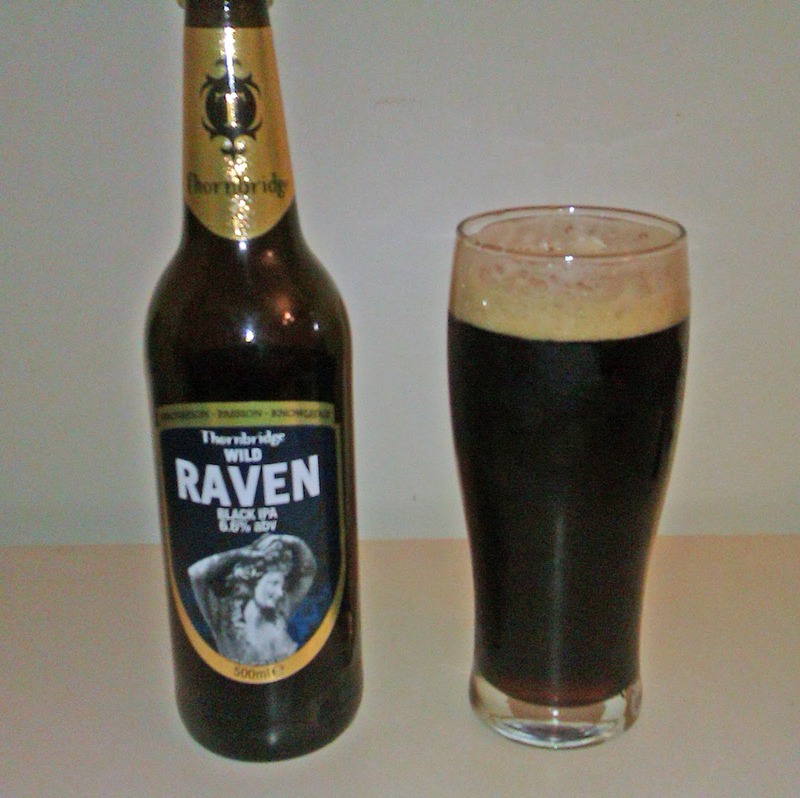 Second: Wild Raven, Thornbridge Brewery. 6.6% ABV. Black IPA. Smelt very much of chocolate fondue (in the words of Sierra). Oranges and berries were present but wrapped in light milk chocolate melting over a naked flame. Poured very dark, living up to the title of black ale without masquerading as Guinness or Murphy's. As advertised, there was a beige head that filled quickly without fuss. Plenty of carbonation but this seemed less added and more conditioned from the bottle (at least if my own ale is anything to go by). Tasting revealed a hoppy start with a definite tang of exotic fruits before an edge of chocolate malt, surrounded by more citrus hops (the bottle suggested pineapple and that seemed pretty close) that was not a little unlike Um Bongo. Then there was a hops explosion that changed character so many times it was impossible to nail anything at all down. So... the 1980s in a glass? Tilly found it "too full of flavours for a beer" and Pik agreed that it was almost impossible to separate out all of the flavours. Everyone agreed that it was "intense" and Pik and I were glad we were on halves or trying to track the different influences would have driven us mad. 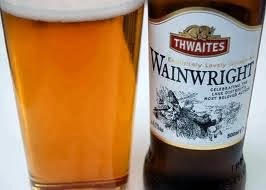 Third: Wainwright, Thwaites. 4.1% ABV. Pale Golden Ale. Opening allowed a yeasty spice mingling with dank musk to escape, a hint of citrus working its way through and hanging around nonchalantly, but the dominant sense was one of the yeast. Poured very much a ligher coloured ale, dark straw, with almost walnut-like tone and warmth to it. Everyone agreed that the taste was "nice" without further elucidation at first. It had the banner across the bottle and Tilly announced that it very much lived up to it: "It is exquisitely lovely golden ale!" Definite yeast opening with the initial carbonation as it wallows around the tongue that slowly gives way to the malt that has the barest hint of caramel. the after-taste was telling in that it was a clear indication that this was our first mass-produced ale of the session. Not a bad thing, but, in the company of the evening, it wasn't doing the ale any favours. 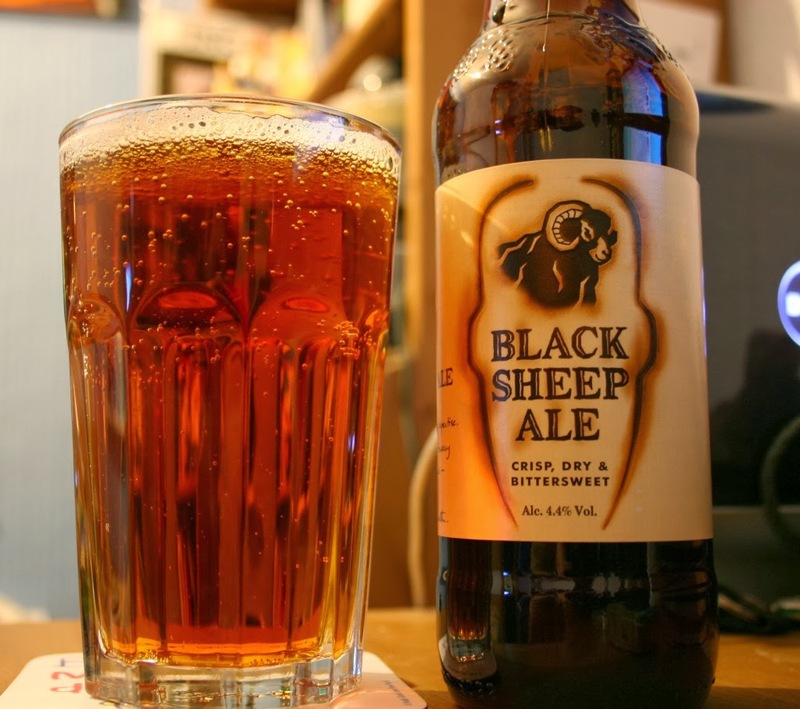 Fourth: Black Sheep Ale, Black Sheep Brewery. 4.4% ABV. Drinking Ale. Crisp and musty vie for control on opening with heavy and yeasty tones shot through. However, the sad fact is that the aroma is very much a reminder that the ale is mass produced in a way that was simply less obvious with the Wainwright and missing altogether from either my ale or the Thornbridge addition. Why? It is dominated by the added CO2. Taste was rapidly adjudged as being "not as much of an adventure" as Wild Raven by Pik and "not bland, but samey enough to be in the background" by Tilly, adding: "sharper than the Wainwright". Pik added that it was "less yeasty". It was definitely the fizziest of the evening and the taste was weak enough that it was murdered by the mere memory of Wild Raven. I was disappointed as I do love this brewery and really rate their ales, but on the evening this just faded and reminded us that it was totally manufactured with a forgettable after-taste that borders on being 'generic'. It's dark and nutty colour with fine head, alas, promised far more than it could deliver. Fifth: Business As Usual, Derby Brewing Company. 4.4% ABV. Amber Ale. This had a smell that was dominated by a mellow malt that almost left us with the sense of Horlicks (helpfully suggested by Sierra). The bottle claimed a toffee aroma and there was certainly an edge of that involved. Suffice to say that it wasn't so much a hoppy ale as it was a malty one. 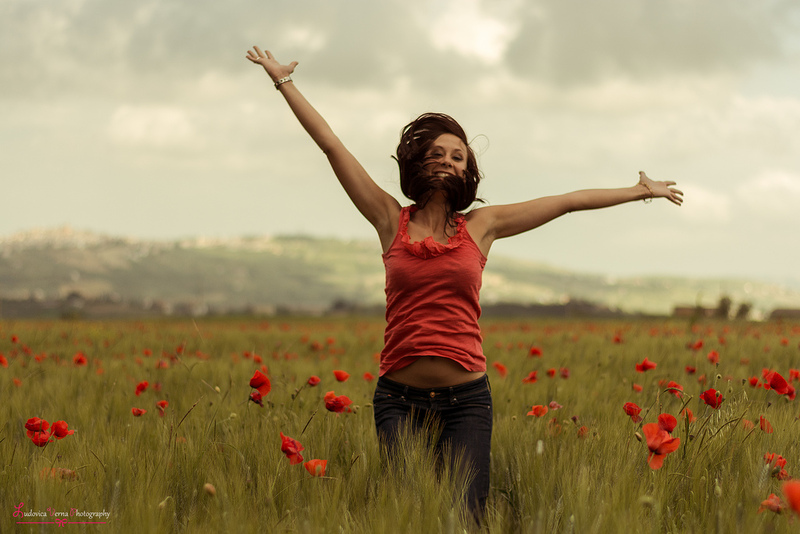 It poured with a minimal, almost white cell like, fizz and a businesslike head. From the first sip it was clear that this lacked the industrial level of carbonation seen in Wainwright or Black Sheep Ale and that lemon and lime citrus hops would play a large role. Pik announced it "one of his favourites so far" and joined Tilly in pronouncing that the taste was 'fresh' and clear (as one would expect with such sharp hops). Indeed, the hops very much forced the malt into hiding for much of the experience but there was enough to prevent an overpowering souring of the taste. A very strong showing for the last ale of the evening. In the event, Pik and Tilly were unanimous in their praise and choice of Business As Usual as their preferred ale of the evening. For me, I thought it was very good but paled against the Black power of the Wild Raven. We all agreed, with varying degrees of sadness, that the weakest showing was Black Sheep Ale. It was simply up against some of the better ales I have tasted of late and thus out-classed by all but the Wainwright, that had the advantage of being light and spicy. My happiest moment of this evening was the fact that all present agreed that my ale was good enough to edge into third place (or possibly second, though I thought that unfair). In such august company I think I canb safely call my first brewing attempt a success.